Auto Sales, Construction Get Totally Crushed. When the oil bust started in July 2014, it was just a blip. By 2015, bankruptcies were cascading through the oil patch. In early 2016, with WTI down over 70% from its pre-bust levels, it got even worse. But the price has recovered some, and new money is flowing back into the sector, and so it would seem that there’d be some kind of recovery in Houston. But the opposite is the case: it’s now getting really tough. Sales of new cars and trucks fell 17% in October year-over-year, according to TexAuto Facts, published by InfoNation via Greater Houston Partnership. It was the tenth month in a row of year-over-year declines. So far this year, sales, at 253,000 vehicles, have plunged 22.1% compared to the same period last year. New car sales plunged 19% in October and 30% year-to-date. Texas is truck country. About three-quarters of all passenger vehicles sold are trucks or SUVs. So you’d think trucks would be the last thing people delayed or stopped buying. But no. Sales of new trucks, SUVs, and vehicles with commercial tags plunged 16% in October and 17% year-to-date. The employment situation in Houston is mixed, as they say. The service sector is doing OK-ish, with jobs increasing by 1.7% year-over-year in September. The goods producing sector has shed 5% of its employees year-to-date. The overall unemployment rate has risen from 4.8% in September last year to 5.7% in September this year. So you’d think that an increase in unemployment of less than 1 percentage point shouldn’t entail a 22% plunge in vehicle sales. But there’s more to it. As oil and gas companies laid off workers and cut back on contractors, it spread uncertainty in the industry and, given Houston’s dependence on the sector, far beyond the industry. So if you’re ready to replace your pickup with 200,000 miles on it, but it still looks decent and runs well enough, you might drive it for a while longer, given the uncertainty, even if you’re still hanging on to your job. And there’s another factor at work. The construction sector is now in free-fall. Houston had experienced a magnificent building boom since the Financial Crisis, fired up by the boundless optimism of the oil boom and money flooding into the city. But in 2015, vacancies began to soar and sublease space began flooding the market, even as new towers were being completed. In 2016, the problem has become pandemic. And office construction is now taking a hit – over two years after the oil bust kicked off. Building contracts for the Houston Metro plunged 23.7% in September and 19.4% year-to-date, with non-residential construction down 26.5% year-over-year, and residential down 20.1%. 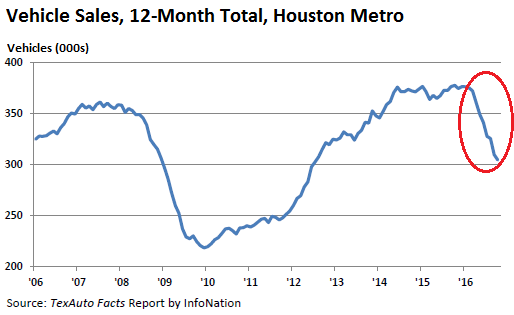 Building permits for the city of Houston plunged 26.4% in September year-over-year and are down 12.8% year-to-date. Residential building permits fell 25.1% in September. That’s terrible enough, but nonresidential permits collapsed by 50.5%! Within a year, the construction business, when measured in building permits, went from boom to sharp deterioration and now to outright collapse. Construction booms of the magnificent kind that Houston had experienced since the Financial Crisis power up a local economy in myriad ways. They have deep and wide economic impact, from raw materials to labor. This includes vehicle sales, particularly trucks sales. But when the boom stops so suddenly, with permits down 50% year-over-year for office buildings, it comes as a shock for the broader economy, from car dealers to banks. And it’s the banks they’re worried about. Read… Who’ll Get Hit by Fallout from the $11-Trillion Commercial Property Bubble in the US? I guess you’ll write about this too, but in Europe it gets even worse. Wolkswagen is going to reduce its workforce by around 20,000 units (30,000 jobs gone, but they may create 9,000 new jobs in electric cars manufacturing). OK, so Huston is no different from Russia. But Russia is already turning around, while Huston is just going into a plunge. The average Russian salary is about 400 per month. The GDP is the size of Canada’s but has to support 4 times as many people. Inflation, especially food price inflation is ravaging the pensioners, who try to subsist on about 150 per month. Even the average Russian spends half his income on food. A middle- class American transported to Russia to take up a middle- class life there would think he had gone to hell. The problem would be finding a middle- class Russian, even relatively. For all the wailing about the disappearing US middle class, this item would be much harder to find in Russia. Life is much more bifurcated between the connected and everyone else. 70 % of the economy is state controlled. A few years ago every second post mentioned Russia’s ‘huge’ reserves. And there are no food stamps. Russia still has reserves and almost no governmental debt as compared to the US which has virtually no reserves and lots of debt. Much of Russia’s “government debt” is in fact carried by its state-controlled enterprises that borrow in dollars, euros, and other currencies in the international capital markets. These enterprises are also responsible for carrying out and paying for part of Russia’s social policies. So the numbers are difficult to compare unless you also look at the state-controlled enterprises. There is no point going into this in depth but one thing sticks out: when Russia’s reserves are calculated, they are in gold or a reserve currency. Russia’s currency reserves are typically $US. Russia can’t print or electronically create a bunch of rubles and call them reserves any more than Nigeria can do this with niara. The ruble doesn’t buy anything outside Russia, it has to be converted into $US or Euros. The US can create as many reserves as it feels like but why bother-it’s the leading reserve currency, and printing costs money. Of course this creation of dollars can be overdone, maybe it has been, maybe tomorrow there will be a run on the dollar. Unfortunately for some large Russian companies, they had run up large $US debts ( incredibly, Russia is not self-sufficient in oil and gas field equipment) so when the ruble collapsed by half, those debts doubled. nick Kelly , been watching CNN lately? You have no idea about the Russian economy! Those people are not in debt like you American debt slaves not even close! You paint with a wide brush my friend. Not all Americans choose to be debt slaves. Yes, there is a high national debt, but I am sure we can work out a repayment plan. I’m not a Putin fan, so I’ll just stay where I am unless a better offer comes along. Russia is definitely not a better offer. Where are the Russian equivalents? Apple alone has more reserves than Russia! A lot of people who know my replies may wonder why I reply to such an inane comment. I feel sorry for the great Russian people who seem to stagger from one disaster to another. May they survive the ‘capo du tutti capi’, Putin. If there are new 175 car and truck dealerships with 30,000 employees in the Greater Houston area it means the average dealership employs 171 people… which sounds extremely high to me, especially given even BMW dealerships (which can afford to charge a premium) have been “trimming fat”, meaning slowly but steadily shedding jobs for years now. If the Association isn’t just blowing smoke, it means these dealerships have not yet begun “trimming fat”, which sounds extremely strange to me given the rout in local car and truck sales and especially the fact car sales worldwide right now work on rice paper thin margins and need large volumes to stay profitable. I watched a cooking show highlighting Houston on tv, it looked like The Bronx. I admit I was surprised, but I don’t get out much. Fracking seems to be in many oil areas. Does a resurgence in oil investment directly translate to the Houston economy because of its oil HQ status ? Probably not in the short run. Much of the cream from new investment will end up in the upper exec. suite. And renewed investment doesn’t automatically translate to another boom. I say this because of the professions cut by the companies during the last couple of years. They have cut many geologist and engineer positions. I see this as management recognizing that oil prices are going to stay in the $40-50/bbl. range for a protracted period of time. Any new investment will be welcomed by the E&Ps, service companies and any others in the supply chain. But it won’t spur quick or greatly increased hiring activity. So, the impact to the greater economy won’t be anything to write home about. When talking about the future of cities who are addicted to an oil economy (Houston etc) maybe we could say something about Climate Change and the coming Ecosystem Chaos that scientists have been warning us about for the last 45 years. Our days of happy motoring are coming to an abrupt end. Climate Change is about to get really nasty. We won’t be able to ignore reality much longer. Sorry, but there are too many cars/trucks built and sold, anyway. 200,000 miles on a modern truck is nothing. I would bet said truck doesn’t burn any more oil than it did from day 1. Run it to 400,000+. Keep it repaired and take care of it. It is not a disposable commodity and should not be treated as such. Maybe it is time to transition to a different economy? I am sure visionaries will see needs and start the process. Change is tough, and I know because I have lost jobs in the past. But, you move on and move forward. There are no guarantees of a safe ride the way we want it to be. None, and there never has been. I guess we’ll see if the new US Govt. will put in place policies to help people move forward. By policies, I do not mean more of the same and same old. If this new Govt doesn’t react to the looming crisis as it should, then it is up to legitimate movements to make them open their eyes. Roosevelt created the New Deal and dealt with the Dust Bowl and migrant crisis. It took writers like John Steinbeck to open the eyes of America. Protest brought the troops home from Viet Nam. Trump says he’ll start on rebuilding infrastructure, and only time will tell if the projects are meant to line the pockets of insiders, or actually help people. God only knows Houston needs help with flood abatement. And if the reins are loosned on coal, they will need need even more help and ideas. Rocky decade ahead, for sure. Sorry but this 200K miles- ‘run it to 400’ does not compute. So a truck with 200 K miles would be 320K kilometers. I can guarantee you that any such truck being sold on a lot (most upper end lots wouldn’t take it) will meet resistance re; high miles. No doubt they exist- but the time it hits that number, it’s only being sold by the estate- the guy loves it. If the average truck owner runs his truck JUST to 200K miles, the biz will feel a lot worse than it does now. I don’t doubt that many of them can be (and no doubt some folks will reply that their’s is) but in general a lot of irrational buying takes place in trucks as in cars. Next time you are in traffic look around- how many trucks or SUVs are more than 7 years old? Or to rephrase the question-how many are paid for? Sorry- just realized I have seen a handful of ad in last ten years or so with over 400K. None over 500. I live in Florida and have almost 200000 miles on a 2002 Tahoe. So far running great with no body rust. Saw my same SUV in upstate NY with fewer miles but loads of rust. Maybe they use salt on the roads in Canada like in NY? They do in east Canada, especially Montreal. Those cars are avoided here on West Coast. Its odd seeing frame rust- it would almost be worth having a drive thru oil spray. Wolfbay- they sure do use salt in the “warmer” spots during the winter (eg East Coast, Southern Ontario). If it gets cold enough (Winnipeg) they use sand, which is a lot better on metal. Given the excellent condition of some classic cars I’ve seen in the Gulf of Mexico area, my guess is that Texan, Floridian, Cuban cars all fare better than their Canadian counterparts. i got 330k on a Honda accord and 356k miles on a Toyota Cressida. The worst car I ever owned was a ford Taurus (POS). Change the timing belt and water pump at 100k miles and do the oil every 3k to 5K and they run trouble free. They required so little maintenance I had my mechanic occasionally check the plugs and they were always fine. It really smells more like the saving and loan debacle than the real estate bubble but we are not here to look back. Forward and fearless! I am afraid the collateral will be of the s&l type much more than the mortgage type of 2008. It has a liquidate and start from scratch feel instead of a willingness to restructure and find value. An out of control bond market makes this a “depression a LA’ mode” and just mailing your keys back to the new owner will not count for community service this time! Debtors prison is a go-go you will work than you sleep. Debtors prison – isn’t that what we call college these days? Lol.. that broke me up.. yep. Truth right between the eyes. Nobody Chinese cuts in the credit markets not even governments? The recent back up in rates should have forced the fed to be on a path to higher rates and not waiting? The FED has to open a new series? Thus giving the bond vigilantes a target to freeze the issue and really get a new higher yield band! (Can a bank really afford to loan money to the fed for a quarter of a percent at this moment?) Thus giving the entire yield curve a positive carry because the new paper is right now ” really underwater”? IMHO, the height of America’s achievement was with the landing on the moon. Trump can make Outerspace Exploration one of the cornerstones of Making America Great Again. And with that he can add “Houston, we have liftoff” to his his repertoire of quotable quotes. Heck perhaps even “America, we have liftoff”. The Wall, Outerspace Exploration, and without a doubt Even More Debt, should fix Houston in a hurry. I must say Russia and the other media dude are both out. Stop judging her and get out of your glass houses. She will be fine and prove everyone wrong as long as you all stay far away! What do you mean about “America will do it on her own, and bc of the judgements and spies, she probably numbs herself bc everyone has taken advantage of her even her own founders, ( who weren’t even there for her when she needed them)”? Could you expand on that? Hey! I’m an English major which is why I ain’t rich. Do you know how much crystal power, auras, chem trail drivel I’ve listened to attentively, nodding in agreement- all in the cause. Another nail in the coffin of the auto industry. Their products do not produce returns for the users … unless the users are farmers driving tractors, deliverymen driving trucks & taxis, construction men driving bulldozers, fire & rescue driving emergency vehicles. The absence of return for 95% of auto use means the payments must be borrowed … which is why the world is inundated with debt. Debt not driving pays for roads, pays for fuel, pays for government, pays for military = insolvency. India just demonetized — got rid of 1000- 500 rupee notes. As much as 80% of India’s cash has simply vanished. How does the oil industry feel about losing a good-sized chunk of its customer base? I learned many years ago in the car biz that the purchase of a new car is NOT a rational act. It can be – some buyers buy just what they need with no frills – but new car buyers generally it’s an emotional outburst. Mid-size cars and crossovers sticker for more than my first new house. And the car manufacturers have ‘bundled’ a lot of the options we used to be able to buy according to taste. Car salesmen who know their product seem to be a thing of the past. I tend to buy new then run the beast til the wheels are the size of walnuts. The sale really no longer is about the price of the car but about the interest rate and add-ons like extended car repair insurance. I’m in the camp that says new cars are a big loss, depreciating from day 1. I have always bought used, even one year old is a better deal than new. I think a of the car – truck sales in the Houston graph above were bought for vanity, and for the business’s vanity. Lots of open straight roads down there, no salt, so they can run 300K miles a lot easier than they can up in NY/NJ on the crappy roads and salt, stop & go much more often. I think a lot of it also as business slows down they do a lot less unnecessary driving, and possibly go on down to the juffy-lube a few more times…… I have seen it in the businesses I have worked for over the years. Less money, the boss’s truck gets replaced a lot less often, and with all that idle time, the equipment gets greased & cleaned. Up here every diesel f-250 & 350 is a stupid vanity purchase. for one the trucks never pull or carry anything, they will never use it enough to pay the difference in the cost of the D, and they rust out before the D will ever die….. Just seems stupid to me…. A poker buddy bought one of those monster V- 8 half tons. I threw a bail of straw in the box when he wasn’t around so he could at least pretend to be a pretend rancher. I estimate the load factor of the consumer trucks around here at less than 5 %. In the case of my friend its 1%- it’s done a few dump runs and one time we stuck my 12 foot boat in box. I always tell who kids who will hear that I have had dozens of cars and have found that the very best car in the world,- is a paid for car.